The title to Boston-slash-New York rockers The Beatings' sixth full-length evokes the surging success of a pro sports franchise making all the right moves perhaps when least expected. Nearly a decade into the band's career (and well into certain members' thirties, marriages and parenthood) is an unlikely time to have created its best, most confident record -- and yet here it is. Late Season Kids is a triumph crafted by a quintet whose tenure is longer than many -- if not most -- big-leaguers and rock acts alike. Although The Beatings continue to calculate the musical mean of noisy indie rock a la Superchunk and Mission of Burma, the band hasn't been coasting. It recently added the latest in a series of fifth members: Greg Lyon, who fronts and plays guitar for Beatings label mates Pending Disappointment, has been officially dubbed (drubbed?) a Beating. As far as the music is concerned, the band purports to have embraced a more pop direction on this latest collection. This we can confirm, but don't expect Barry Manilow here. Instead, The Beatings furnish a ready supply of its familiar fist-pumping anthems, such as the four-on-the-floor "Youth Crimes," with the fivesome's typical noise quotient dialed back somewhat in certain places. The subdued and downright spooky "Ways And Means," sung by bassist Erin Dalbec, is a taut, but calming deep breath later in the album. The Tony Skalicky-sung closer "Dreams Of The Waking" both recalls Versus'/The Godrays' "Crazy" and sounds like the cover closing on a book. But not everything is toned down. The redemptive caterwaul of co-fronter E.R. drives the album highlight "All The Things You've Been Missing" repeatedly into a chorus built on a scalding baptism of blaring, reverbed guitars. At the break-down he spits lines that recall Lloyd Dobbler dialogue, before spinning the song on its side like a bottle cap into a jabbing, acerbic coda. The following track, the thriller "Parts-Per Notation," leads with the almost comically understated line "I think I'm going to explode" (reinforcing the earlier sentiment "it takes all of my patience not to lose control" from "Youth Crimes"). On Late Season Kids the band swings for the fences and connects like batters in their prime. The propulsive energy captured within the set -- but to a lesser extent in the respective side projects fronted by E.R. and Mr. Skalicky -- suggests that The Beatings' secret weapon is the all-business but unflagging rhythm section comprised of Dennis Grabowski and Ms. Dalbec. 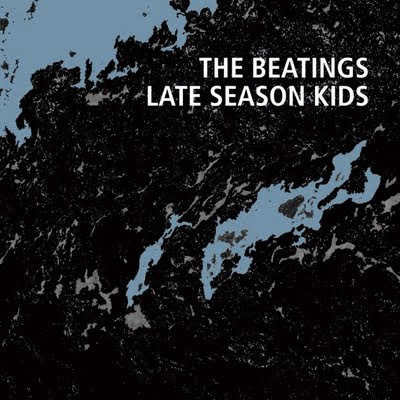 The Beatings released its prior set Holding On To Hand Grenades on Midriff in 2006. The band celebrates the release of Late Season Kids with a record release show at Boston's Great Scott Sept. 12 (with support from label mates Hands And Knees and rising indie pop superlatives The Hush Now). The official release date is Sept. 15.